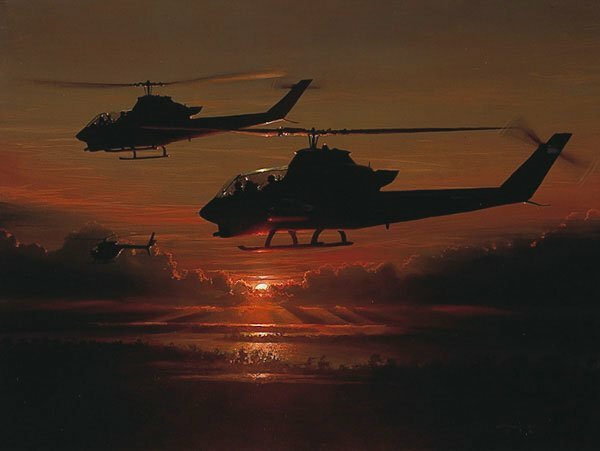 As dawn breaks in Northern South Vietnam, two AH-1G's of F Troop, 4th Cavalry begin a search and destroy sweep led by an OH-6A Loach. Although heavily armed, both the scouts and the gunships were in constant danger from hostile ground fire. These conditions and the close proximity to the ground required the utmost in skill and courage from each crew . . . for every time they were "Heading for Trouble."